GelatoMadre reinterprets with Pastiglie Leone a product for refined palates: mint gelato. Since 1857 Pastiglie Leone represents a world of sweetness, a true unicum of the confectionery universe, based on artisanal production and careful selection of raw materials. "Marca Leun" in Piedmontese dialect is a synonym of a craftily production and of indisputable quality. Flavours so intense that go through the years and recall stories of a past time, like that of the Piedmontese Peppermint from whose leaves you get a precious essential oil. 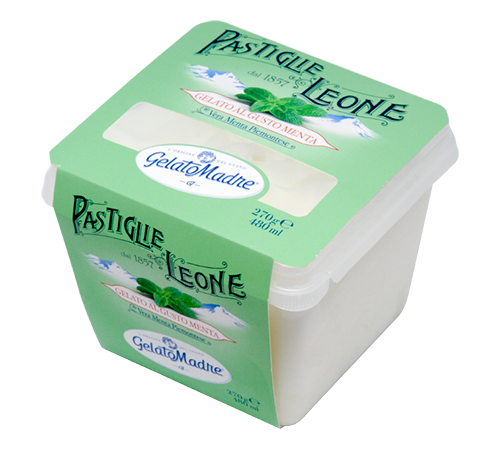 GelatoMadre Menta Pastiglie Leone is a genuine product, made only with 4 natural ingredients for a unique tasting experience. in the Special Edition tub 270g.